Robotic surgery is a process in which a doctor controls a surgical device or machine that makes an incision in the area of the body on which they will operate. The machine, rather than the doctor, enters the incision and functions based on the doctor's direction. 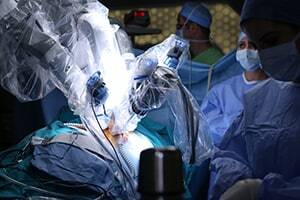 The surgeon controls the robot arms, and a camera develops a three-dimensional picture of the patient's body. The doctor is then able to find and shift, remove, or collect parts of specific internal areas. Although this type of surgery is common, there is still a possibility of malpractice. If you have been injured by the misuse of a surgical robot, the Chicago robotic surgery malpractice lawyers at Moll Law Group may be able to help you recover compensation. Robotic surgery is used to remove cancerous growths, repair hernias, and conduct other surgical processes. Although tools are used to remove or shift tissue and organs in a robotic surgery, the tools are still controlled by the surgeon. Robotic surgery reduces the risk of infection and the time that it takes to recover. It can prevent excessive blood loss. In spite of these benefits, however, robotic surgery can injure patients. Often, the harm that results from a robotic surgery is a result of an error by the surgeon. For example, a surgeon may not fully understand the machine performing the surgery, or they may make mistakes while operating it. Sometimes the surgeon may misread the three-dimensional visualization and use the wrong procedure on the patient's body. In other cases, the doctor may move the device into the wrong body part. A robotic surgery malpractice attorney at our Chicago firm can help you investigate where the surgeon went wrong. Sometimes the robot device malfunctions. It may puncture the wrong part of the body or harm it. The wrong tools may be used. If parts of the tools fall or break off into the area where the robot is working, they might be left inside the body. Sometimes, if there is electric sparking or too much heat, shock can occur. The robotic surgery device is supposed to be sterilized so that infections are not caused. The device is supposed to be calibrated and tested frequently enough to keep the device working appropriately. If problems arise during calibration or testing, the device should be immediately taken out of service and repaired prior to the device being used on a patient. If you were injured during a robotic surgery, our Chicago robotic surgery malpractice attorneys may be able to recover compensation by bringing a medical malpractice lawsuit against the parties responsible for controlling and maintaining the robot. The circumstances will dictate who should be held responsible. Generally, you will need to show that the health care provider whom you are suing owed you a duty to abide by a certain standard of professional care, deviated from that standard, and thus caused your injuries. In a surgical malpractice case, we will need to retain an expert on the standard of care applicable to your situation. Forms of compensation that you may be able to recover if you were injured by robotic surgery malpractice include economic and noneconomic items, such as pain and suffering, medical treatment to correct the harm caused by the malpractice, lost wages, lost earning capacity, and household services. There are some situations in which robots have injured patients even when the health care provider has acted in accordance with the professional standard of care. For example, there have been reports of robots not letting go of a patient's tissue. There have also been claims of defective surgical tips. If the injuries were caused by a defective robot, rather than medical malpractice, we will be able to determine that fact and pursue compensation from the appropriate party. If you are injured as a result of robotic surgery malpractice, the experienced attorneys at Moll Law Group may be able to help you pursue legal remedies. We represent patients and their families in Chicago, Wheaton, Schaumburg, Naperville, and throughout Cook County. Call us at 312-462-1700 or complete our online form to schedule a free consultation.